The first shell landed at 3pm precisely. Casaubon was at his desk, working on the manuscript, and was aware of the ground rocking to one side and back beneath his feet. A second explosion shook the wall to his left and detached a shelf covered in papers. It and they fell, and the room was temporarily covered in a fine dust. A lesser man might have attempted to estimate the distance of the shell’s landing from his present position, or have distinguished from the sounds of the shells the nature of the artillery from which they had been fired. Casaubon being utterly above such trifles was aware only of the threat they represented to his own person. Being a man of (he modestly accepted) no little courage, Casaubon settled on the first plan that came to him. He would insist that Charles, the department’s Boy, and in charge of the Department’s administrative affairs for the past two decades, announce that Casaubon’s early evening lecture was cancelled. With a firm step and real purpose, Casaubon walked towards the plastic telephone situated at the back of the room. He lifted the receiver; the wire had been cut. Opening the door and looking out into the corridor, Casaubon noted that Grace, the department’s Secretary, had also absented herself. Where he would expect to encounter noise, there was silence. Someone must have warned the others. Casaubon founding himself staring at the other – right – side of his room, where he had placed a decade ago his certificate from the Royal Society, awarded for his service to the Philosophy of Warfare. The document was printed on heavy, embossed paper. Among the many features which endeared it to Casaubon was the precise language of the dedication. An unwise academic at another University, on making Casaubon aware of the proposed content of the award, had foolishly suggested that he should be honoured for his services to History. Casaubon had cut him dead at three consecutive conferences, and allowed it to be known to the unfortunate man’s successor within the Society that he would accept this modest honour only if all reference to History was excised. Casaubon was a committed champion of his position within the academic hierarchy: the most distinguished contemporary theorist of the idea of military combat. Lesser figures liked to imagine that Thucydides that been interested in a particular conflict, had busied himself with a certain war. Casaubon had demonstrated that they were wrong, that Thucydides was writing rather about War in general, all wars, had never felt a need to descend from the abstract to the concrete, and was just as correct and absolutely true if one swapped sixth century Syria for fifth century Sparta, Algeria for Athens, or the middle ages for the ancient world. The gunfire was getting closer. 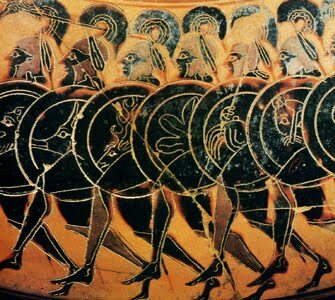 Greatness, Casaubon had earned by a series of studies which had proved that Thucydides’ History of the Peloponnesian War was a total analysis of all conflict, a complete and perfect system of analysis, marked by no significant ambiguities or contradictions: a circle as perfect as a pure zero. The present manuscript was intended not merely to preserve the name of Casaubon for the indefinite future but also to do something to lift the cloud that hung over the Department. Casaubon had advertised the book’s intended arrival in an attempt to rally his supporters during a recent, ill-tempered, staff meeting called to discuss the defection of the majority of the University’s postgraduate students. In his present state of personal magnanimity even he would acknowledge the pleasure it had given him to use the book to cast scorn at any number of his critics. He walked to the wall and carefully removed the certificate. When they found him, he was on the floor of his room, tears dripping from his face. The certificate was still clutched to his chest.